I am almost done with my ornament wreath that I learned how to make from Eddie Ross. You should check out his tutorial. 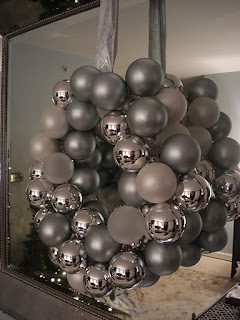 It's super simple and very inexpensive, not to mention the end result looks fabulous. I need to purchase a few more ornaments from the thrift store, and mine will be complete. I'm going with a gold and cream color scheme. And since all of my ornaments came from the thrift store, most of them are older and already have an antiqued look. The total cost of the project will be around $12!